Today’s story about the Scottish Women’s Rural Institute in Cambusbarron, heralds a special summer exhibition at the Stirling Smith, beginning 15 July. ‘Crafty Goings On!’ celebrates 100 years of the SWRI, now the Scottish Women’s Institute, and features intricate craft work from members of the Stirling, Clackmannan and West Perthshire Federation. The SWRI was founded in June 1917 by Catherine Blair, an East Lothian farmer’s wife, who recognised a need for women living in rural areas to gain the benefits of education and training in home skills. The photograph was taken outside Cambusbarron Community Hall, 18 August 1959 and shows the SWRI Hillfoots Group (Stirling & West Perth Federation) welcome to the Associated Countrywomen of the World. Led by Mrs Freda Goonewardene, Ceylon, the group included women’s organisations from Africa, Australia, Belgium, Denmark, Guernsey, Holland, Norway and the USA. 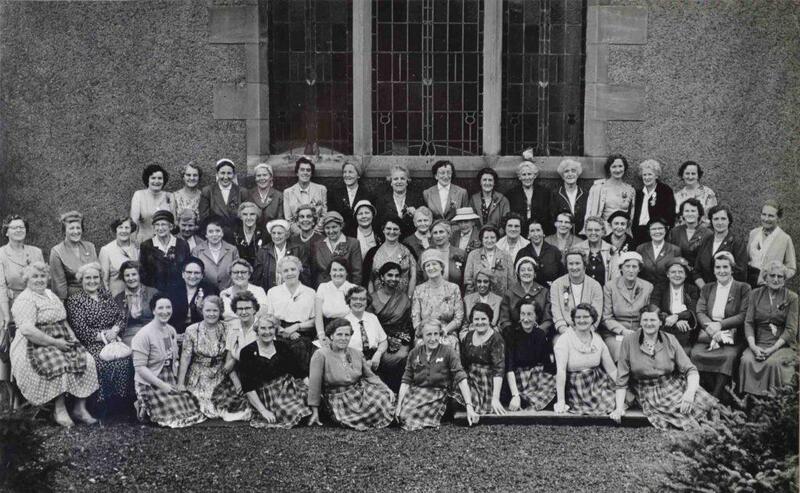 This event was part of the ninth triennial conference of the Associated Countrywomen of the World, held for the first time in Scotland, 4 August 1959. The group in this photograph toured the Perthshire Highlands. They were then entertained to tea on the last day of their tour by the committee of six rural institutes comprising the Hillfoots group. Tea was served by members of Cambusbarron WRI in their tartan aprons. The hall was decorated with flowers and tartan drapes.